Patients in the International Metastatic Renal Cell Carcinoma Database Consortium (IMDC) intermediate-risk group have heterogeneous prognoses and thus may benefit from improved risk stratification. The aim of this study was to analyze inflammatory parameters such as C-reactive protein (CRP) and neutrophil-to-lymphocyte ratio (NLR) as prognostic markers for IMDC intermediate-risk patients. 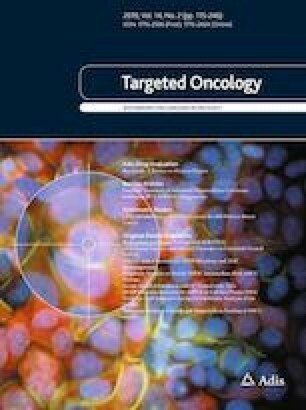 Patients with metastatic clear cell renal cell carcinoma (n = 71) with IMDC intermediate risk who received tyrosine kinase inhibitors as first-line therapy were included in this retrospective study. Multivariate Cox regression analyses were performed to identify prognostic factors for overall survival (OS). As first-line systemic therapy, 46 (65%), 19 (27%), and 6 (8%) patients received sunitinib, sorafenib, and pazopanib, respectively. An IMDC prognostic score of 1 and 2 were observed in 34 (48%) and 37 (52%) patients, respectively. Mean CRP level was 1.06 mg/dL, and mean NLR was 3.0. Multivariate Cox regression revealed several factors significantly associated with poor OS, including NLR ≥ 3 (vs NLR < 3; hazard ratio [HR] 2.57; p = 0.0228), CRP level ≥ 1 mg/dL (vs CRP < 1 mg/dL; HR 2.89; p = 0.0279), and two or more metastatic organs (vs one organ; HR 3.77; p = 0.0008). Using these risk factors, patients were stratified into the following three risk categories: F0 (no prognostic factors; n = 20), in which the median OS (mOS) was not achieved; F1 (1 prognostic factor; n = 31), in which the mOS was 31 months; and F2–3 (2 or 3 prognostic factors; n = 20) in which the mOS was 13 months (log-rank p < 0.0001). CRP, NLR, and the number of metastatic organs were independent prognostic factors in IMDC intermediate-risk patients. We thank Ms Nobuko Hata for her secretarial work. Toshio Takagi, Hironori Fukuda, Tsunenori Kondo, Hiroki Ishihara, Kazuhiko Yoshida, Hirohito Kobayashi, Junpei Iizuka, Masayoshi Okumi, Hideki Ishida, and Kazunari Tanabe declare that they have no conflicts of interest that might be relevant to the contents of this manuscript.